Weekends are for… eggs Benedict! The weekend is here! Weekends are the best time to put in some proper effort into cooking some proper breakfast – don’t you agree? 1. Melt the butter in a pan over a gentle heat, then carefully pour off the golden oil into a jug and discard the milky solids. Set the clarified butter aside to cool until lukewarm. 2. Put the egg yolk and 1tbsp cold water into a heatproof bowl and fit snugly over a pan of gently simmering water. Whisk by hand/ using an electric whisk, beat until very light and frothy (this makes it easier to incorporate the butter). 3. Remove the bowl from the heat and continue whisking for a couple more minutes, then slowly trickle in the runny butter as you continue to whisk. Don’t add the butter too quickly or it will curdle. 4. When all the butter is incorporated, season with salt and add the vinegar, lemon juice, cayenne and white pepper. Finally, fold in the fresh chives. 5. Set the bowl back over the pan of water (but off the heat) to keep warm; stir occasionally to stop a skin forming. If the sauce does happen to split, whisk in a trickle of cold water to re-emulsify it. 1. 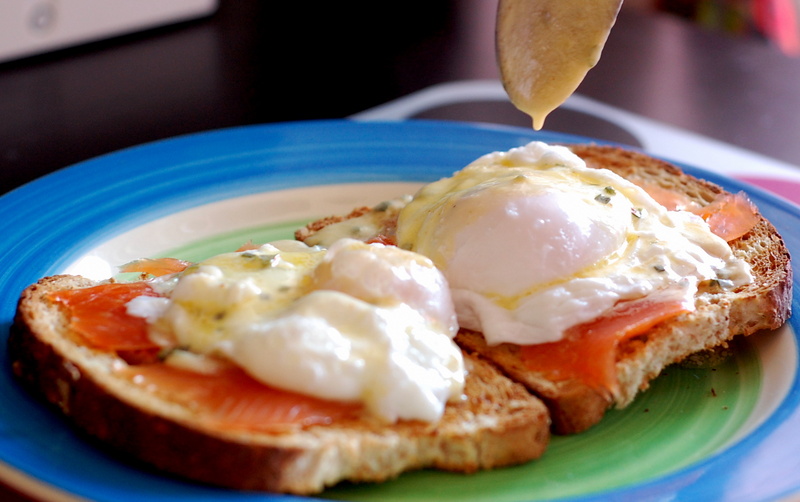 Crack on with your poached eggs. 2. To assemble, toast your bread/muffins and place on warmed plates. 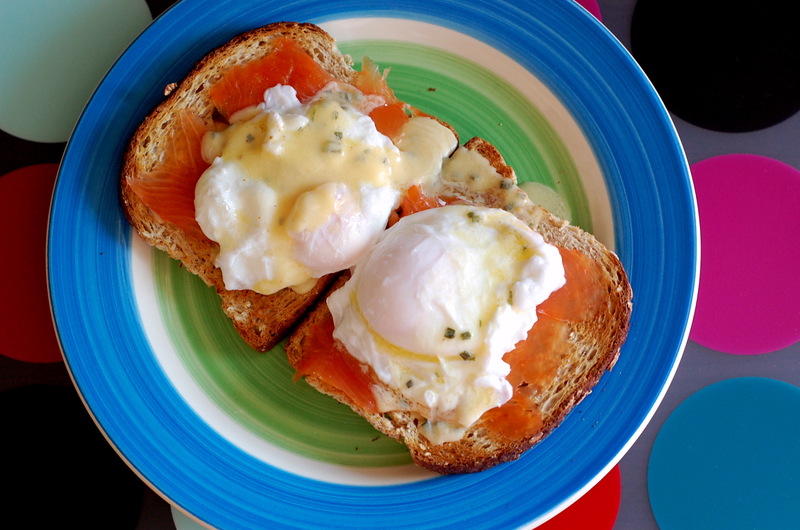 Arrange a slice or two of smoked salmon on each slice of toast, sit a poached egg on top and finally coat with the warm hollandaise sauce. 3. Serve up with a nice cuppa. Enjoy! Yields enough sauce for 2 servings. Recipe for the hollandaise sauce adapted from Gordon Ramsay’s cookbook, Gordron Ramsay’s Secrets.